If you were to ask any F1 fan to take part in a word association test, and then say 'Toro Rosso', the phrase 'Red Bull's B team' would not be far from the first response. It's certainly an odd state of affairs, as well as a potential conflict of interest, the likes of which it's hard to imagine being allowed in other sports (for example, could you imagine Manchester United being allowed to buy Bolton Wanderers?). Still, the relationship has just about stayed above board since Toro Rosso came into being in 2006, including throughout 2008 wherein the B team were generally the more competitive of the two. The technical ties between Red Bull and Toro Rosso aren't as strong as they once were, and while some rubbing off of ideas may be inevitable Toro Rosso definitely stand on their own two feet design-wise these days. But one B team role for Toro Rosso does remain at the forefront: that of developing drivers for the big team. And for that reason the Faenza squad have an all-new driver line up for 2012. Some observers of Buemi and Alguersuari in action indeed reckoned that they weren't quite pushing the boundaries out on track like the top drivers do, and the Toro Rosso engineers, with access to tyre load data and the like, apparently concurred with this. Red Bull don't appear afraid of making ruthless decisions with their driver pool, so out Buemi and Alguersuari went, and in come the latest models: Daniel Ricciardo and Jean-Éric Vergne. And with a potential vacancy at Red Bull for 2013, with Mark Webber's contract up, opportunity knocks and knocks quickly for both. Both must impress right away in 2012, and if they don't they could be the latest to find themselves discarded. In terms of the Toro Rosso team itself, while they've never been able to replicate the success of 2008 with Sebastian Vettel at the wheel, they have established themselves as respectable midfield runners, even though of the midfield bunch they have the fewest personnel. And they continued to progress in 2011, coming eighth in the constructors' table, and a strong late season run was very nearly rewarded with seventh place in the standings ahead of Sauber. 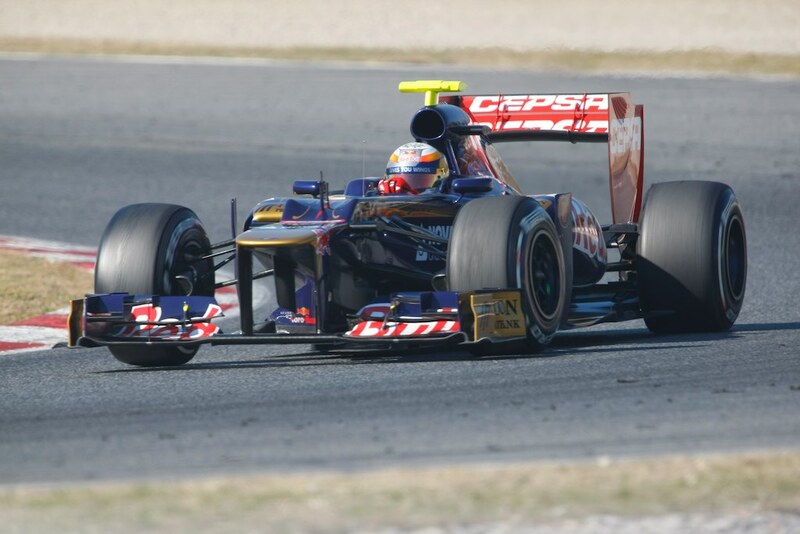 In 2011 Toro Rosso practiced some innovative thinking in their STR6 design, especially with aggressively undercut sidepods and a double floor reminiscent of the 1992 Ferrari, to promote more airflow to the diffuser. On the other hand, it meant a higher centre of gravity which didn't serve it as well on the slower tracks, but technical director Giorgio Ascanelli felt it was well worth the trade off, and many other teams are honouring this by imitation on their 2012 machines. Last year Toro Rosso didn't receive full exhaust blowing software from Ferrari until the Spa round, and an improved DRS and then a Red Bull-style exhaust appearing in Suzuka resulted in the team being consistent runners in the top ten, culminating in both cars qualifying in the first ten in India. The improvement led to much muttering that Red Bull were offering some technical help, but this was not so and indeed, Ascanelli sees it as a great compliment to his fledgling aero team that is only two years into its existence. The sidepod philosophy lives on at Toro Rosso for 2012, and there are also other interesting design features such as in the airbox. As with most of the midfield, it's next to impossible to judge exactly where they are in the competitive order. And like most others, there are positive noises emitting from the team. That they're not conspicuously chasing 'Holywood times' (and they're doing enough pit stop practice for the rest of the grid put together) is possibly a good sign, in that it may show a confidence in how the machine is working. Martin Brundle for one named Toro Rosso as dark horses for 2012. On the other hand, some who have watched the STR7 out on track in testing reckon it looks oversteery, with not a lot of grip at the rear. 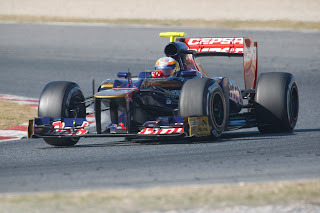 But as far as the parent company, and many watching on, are concerned, their eyes will be on the Toro Rosso drivers in 2012. Daniel Ricciardo has been the conspicuous golden boy of the Red Bull young driver programme for some time. He got his F1 debut last season, bringing with him a big reputation. It was built with a good record in the lower formulae and amplified by his performance in the Red Bull at the Abu Dhabi young drivers' test in 2010, where he managed to beat even the pole time set by Sebastian Vettel days earlier. Red Bull clearly were minded to slot him into a race seat somewhere during 2011. The initial candidate was Toro Rosso, but a space couldn't be cleared there so Ricciardo ended up at the back of the grid with HRT. When in such a struggling team, it was very hard to judge what exactly Ricciardo was bringing to the party. But after a bedding in period Ricciardo did get the upper hand on team mate Vitantonio Liuzzi, though Liuzzi returned to being on top in the final two races. But the feeling persisted that if Ricciardo was all that he should have been doing more; indeed, people in his team reckoned that, while he was safe, he was holding a certain something back when out on the circuit. Further, being beaten by the returning-for-one-weekend-only Karthikeyan in India in both qualifying and the race (though he had a botched pitstop on race day) was a definite bum note. Given his lack of testing and the potential negative consequences of smashing the thing up, Ricciardo's circumspection was perhaps understandable. But as Gilles Villeneuve used to say, you don't know where the limit is unless you go over it. The idea thus began to swirl that Ricciardo perhaps wasn't all he was cracked up to be. It was therefore a bit of surprise that Ricciardo was rewarded with a Toro Rosso race drive for 2012 (he had for a time been linked with Caterham instead). As explained, he can't afford to hold anything back there this year. Jean-Éric Vergne is one of three drivers who make up the long overdue French driver renaissance in F1 this year. He makes his race debut with a remarkably similar CV to Ricciardo's. He's a member of the Red Bull young driver programme, he's a British Formula Three champion, and finished second in the Formula Renault 3.5 World Series after losing out in the final race, and also like Ricciardo impressed with his lap times set in the Red Bull in the Abu Dhabi young drivers' test (in his case in 2011). Such similarities may go some way to explaining why in many observers' eyes there has been something of a conflation of the two drivers: many talk about them like they're one and the same! But in many ways the challenge that faces Vergne is indeed one and the same as for Ricciardo. He must impress in 2012, and demonstrate that he's worthy of a front-running Red Bull race drive. If not, he could well find himself with an F1 career over almost before it began. And, without testing and with the pressure on, he really cannot afford much of a settling-in period. If nothing else, that will likely give Ricciardo the intra-team upper hand. But Vergne's record in lower formulae, such as dominating British F3 and being an immediate front runner in Formula Renault World Series, shows a lot of promise, and that a lot of talent is there. Maybe not everyone envies Vergne's task for 2012, but on the other side of the coin it's a wonderful opportunity for him, and one that many drivers, even within F1, would love to have.